Film Review: The Grey | Mehta Kya Kehta? “You’re not the animals. We’re the animals!” shouts a man into the darkness. He severs the head of the wolf the group is roasting and flings it to the eyes that see them but they can’t see. Silence respects that moment of anger, and acknowledges the men’s collective will to overcome the hardships they are yet face and to come out of their ordeal alive. The silence is then broken by the dark forest howling back at them, and the group of men understands that they can’t intimidate what is hunting them down one by one. 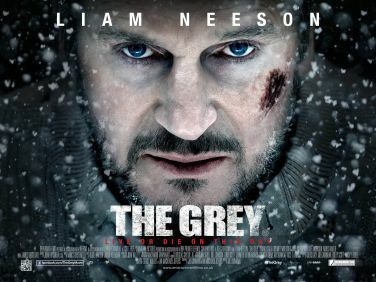 “The Grey” is hardly a movie about wolves. It’s a movie about something much more than fighting wild animals in terrible weather. 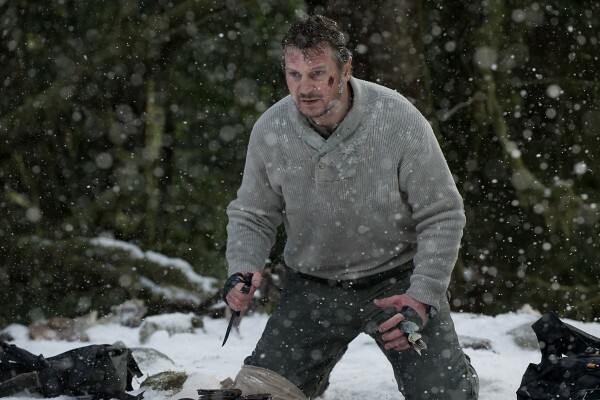 Liam Neeson plays a sharpshooter who guards people from wolves. After a plane crash in an icy region, he leads a group of survivors from the wreckage to a forest far away where they might be sheltered not only from the wolves, whose den they are close to, but also the blizzards that give the men a break only once every few hours. The blizzards are relentless because that’s how nature can be, and the wolves are pissed off because the group is in their territory. Of the seven survivors, a few are torn apart by the pack of wolves, while some die in accidents trying to find their way out, and one gives up and chooses to not return to his life of drilling in the day and drinking at night and stops by the lake from where he can see the trees and mountains and decides that the spot will be his final resting place. Proving too alpha for the weather and the animals, however, is Mr Liam Neeson. He takes charge right from the start: getting the men to leave the wreckage before they freeze to death, making everyone take turns at keeping guard while the others sleep, telling them the psychology of wolves, and showing them how to make weapons to fight the pack. Neeson’s the alpha of the human pack, the top dog who keeps hopes up and makes things happen. The Grey moves at a slow pace without any pauses or gaps. The thrills don’t come by the minute, but prove heavy when they do come. So it’s wolves attacking when they’re least expected to be around, and having to jump off cliffs because there doesn’t seem to be another way down to the gushing water, and when the men are safe from the blizzards, it’s the beautiful mountains and trees that are as dangerous a setting. It’s men dying one after another, killed by animals or accidents or by giving up hope. It’s a movie with a heart, and has people talking about their loved ones and looking at photographs in wallets. The movie is a lesson in alpha-male behaviour taught by an alpha male. Ottway (Neeson) is a nice guy fighting for survival in a tough situation, and this is highlighted in the last scene, when you learn why he’s been thinking about his wife so much, when he realizes that where he has stopped is the wolf den that they’d all been wanting to get very far away from. The wolves that surround Ottaway leave when the leader of the pack shows up, and the two alphas make eye contact and get ready for the final battle. Oh, great movie. Not for the action, but there’s the poem Liam Neeson’s father used to recite, and one which plays throughout. Some of the greatest four lines ever committed to film, in context with the overall story. Did u see the post credits scene where Neeson is resting his head on the heavily breathing lying down Alpha! just this 20 seconds visual packs in a lot of punch minus any lines! No, I missed that! I was told it’s Neeson’s head and the wolf’s stomach. So they’re both alive in that scene, yeah? Neeson what an actor..what a persona…he has the physical presence to portray reckless brute force but at the same time he can also be counted on to give performances of characters with an active intelligence! Wow hmm I looks like it could be good, but with Clash being one of my all time favorite chodohlid movies. It will be interesting to see if the movie is as rock n roll as the trailer would have us believe. My biggest problem with the entire trailer is actually just one small clip where someone is running down a hill in the woods. It looks ridiculously CGI, which is probably my biggest hangups with modern movies. I loath being pulled out of a movie when CGI replaces a person and its done poorly. Awkward movement is usually the giveaway.